Guess what? Adam, Cecil and I are FINALLY moved into the new house! It occurred to me somewhere around 2pm on Friday that we were planning to move but had not packed a single box! So, from 8pm until 1am we sorted, wrapped and packed up our lives. Our alarms went off at 8am on Saturday and moving commenced! It took us all weekend but all of the boxes are now unpacked. We knew we needed to get everything out because we scheduled our cleaning ladies to come 9:30 this morning and didn’t want them to have to work around the boxes. Make no mistake about it, the house is still a mess :). I have been listening to the Young, House, Love podcast for a couple of months now and Sherri says when you first move everything can feel disheveled and out of control. To combat that on the first day create a little space that you can arrange and feel happy with. When she last moved she setup and decorated a bookshelf. 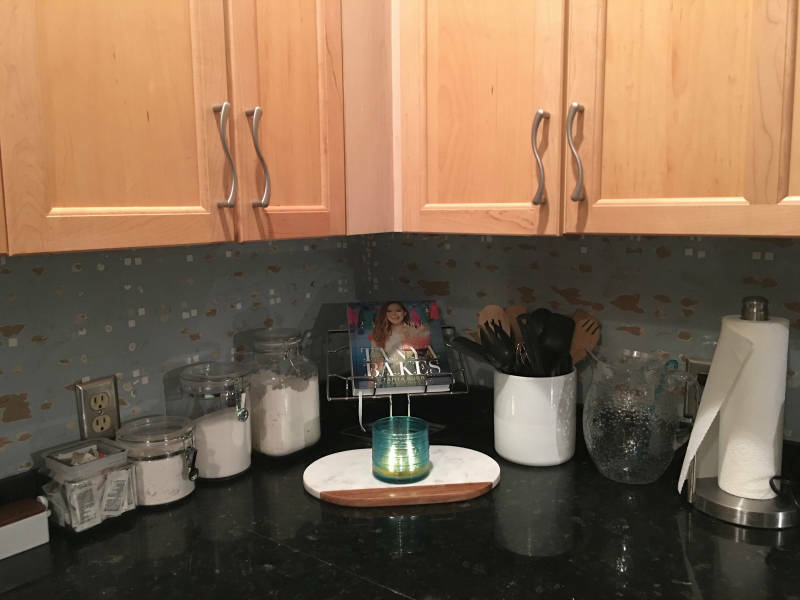 I decided to create a little spot in the kitchen that provides a sense of normalcy for me. ^ I think I’ve mentioned before that our kitchen backsplash is a mess. We’re installing new drywall and then a new backsplash in a couple of weeks. I haven’t run one single mile since Thursday. I don’t really want to talk about it except to say I am looking forward to running tonight! I hope you had a great weekend! I gotta run and schedule the decorating fairy to come and wave her magical wand! Do you do anything fun this weekend? Finish up your holiday shopping? Previous Post Holiday Gifts for Runners From Amazon (Treat Yourself Too)! Next Post Catching Up on Life! Moving is so much work! It definitely takes some time to feel settled. Thats smart to have that one part of the house that makes you feel happy. I really wish there was a decorating fairy too! I like that tip from Sherry about creating a space of normalcy. I’ve always done that when I’ve moved, although I never thought about it until now. Good luck getting settled in! It’s a pain but hang in there. That’s really good advice. I always do that when I move. Usually I set up my bedroom first. I get my night stand set up the way I like it, and the bed arranged and made. That way when I go to bed, it feels like home. So glad you guys are on your way to getting settled in your new place. Since the bedroom is the place where you need to be able to relax completely it makes so much sense to tidy up your night stand. I wish I had thought of that. Ours are both totally empty right now! Congratulations on the move!! how exciting and nerve wracking at the same time! Good idea on having a small homey place! When I moved, it was so much work that it counted as a work out for me. I got more steps that weekend than I did running! and I lost weight. It was exhausting! YES! Moving is totally a full body workout! I was sore on Sunday, haha! Yeah!! That is so exciting that you are moved! Does your new place sound different at night? For me that was always the odd part- hearing a whole new set of things in the night! Especially interesting was hearing trains and owls at or place. Great idea to make your calm space. That will be a sanity saver! You can hear owls?! That’s so cool! Our new house is actually only about 2 blocks from our old apartment so the sounds are almost exactly the same, haha! Woooooo congrats!!! How does Cecil like it? You enjoy decorating, correct? That is a very good idea to set up a little area that is normal. What’s next? Living room?? Love the look of the kitchen corner you posted. Excited to see what the finished product will look like! Congrats on the move–how exciting! 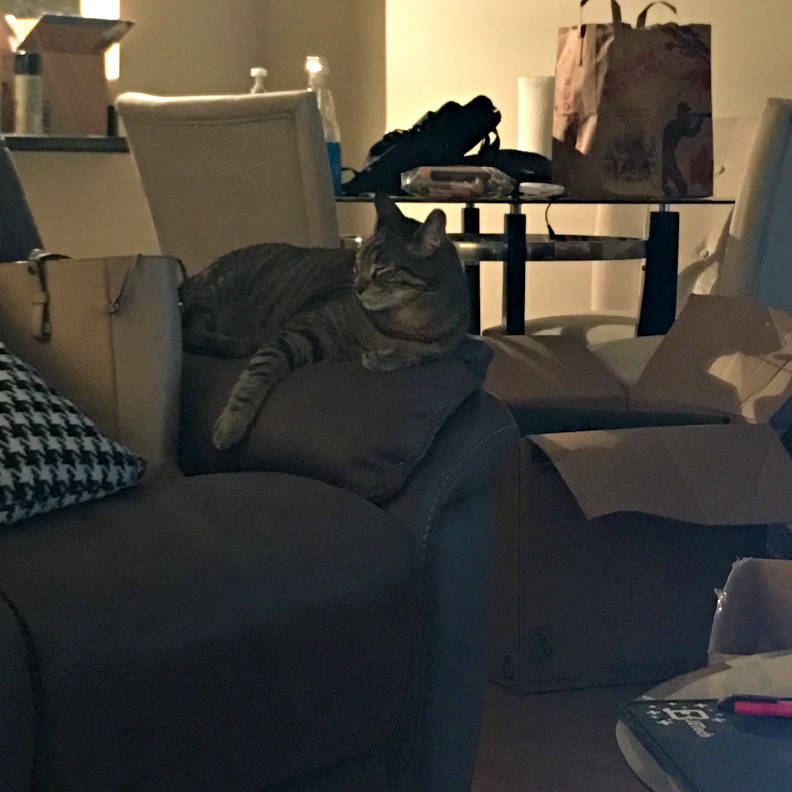 🙂 I can’t believe you already unpacked all of your boxes. Last time we moved it probably was a month before we unpacked every box. HOORAY!!!! I’m so excited for you!! Hooray! You’re finally moved in! Hey now, it’s a building process right. Just like training for a race. Your in the base building phase lol. Hey moving in is a huge step, it’s done. You will have everything situated in no time and be very happy with your new home. Just have to take one step at a time. You are always the voice of reason! Thank you!! Congrats on settling into your new home. I know how crazy it can be to get situated and settled. Plus, if you are anything like me, I couldn’t think about anything else until I felt “really” settled. I hope you enjoy the decorating process. Soooo, just out of curiosity… and you might have mentioned this before…. what does it mean now that you and Adam own a home together? Wedding bells?